← The Greatest Book on Earth! A Question that Will Determine Your Eternity: Who Is Jesus? Who is Jesus to you? According to a recent Rasmussen poll, 84% of our fellow Americans believe in Jesus. That’s good news until you press them on what they mean by that. Then the answers get a little sketchy. 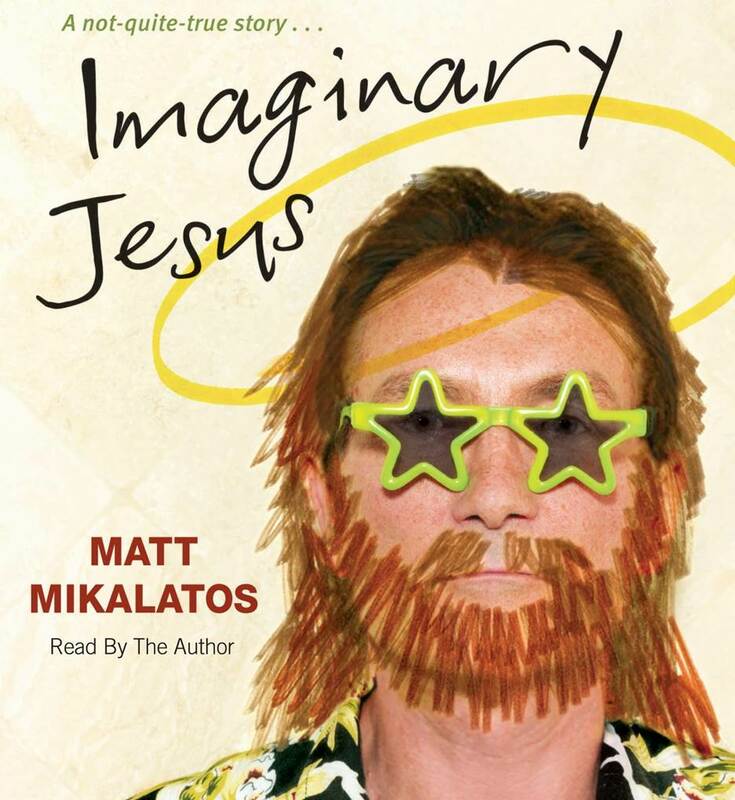 One author, for example, set out to discover what his fellow Portlanders believe about Jesus. 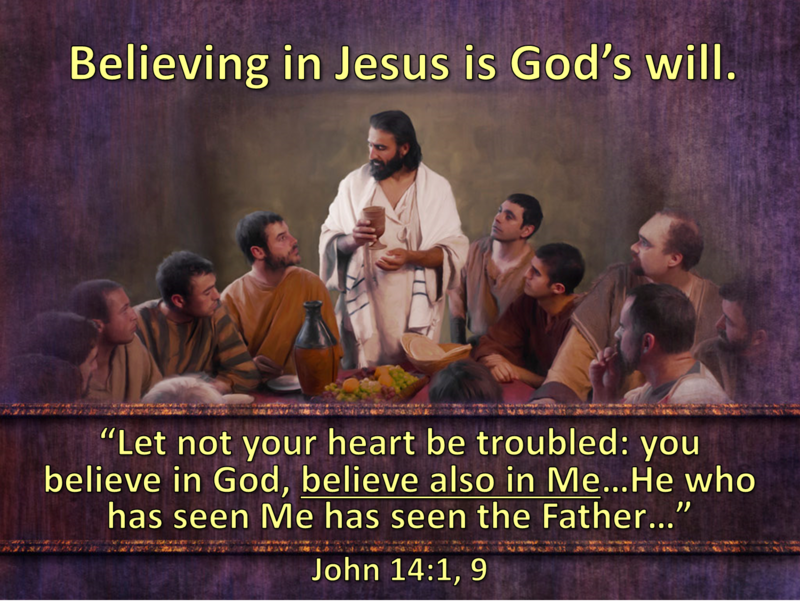 The results were disturbing for while most of them claim to believe in Jesus, the Jesus they believe in is very different from the Jesus of the Bible which makes him, in the author’s words, an “Imaginary Jesus.” To name just a few, there is Legalist Jesus who has a rule for everything; Televangelist Jesus who says if you have enough faith, you need never get sick again; Social Services Jesus whose priority is that everybody’s creature comforts are met; Bargain Jesus who will answer your prayers if the price is right; and Hippy Jesus who wants us all to just chill out and learn to live together in peace. But then this is nothing new! Down through the centuries there have been countless “Jesus’s” who fall far short of what the Bible says about Him—Islamic Jesus who was just one in a long line of prophets; Buddhist Jesus who was a great enlightened master; Mormon Jesus who is the good Son of Elohim and brother of Lucifer; and New Age Jesus who is a wonderful spiritual guide and guru. The truth is almost everyone believes in “a Jesus.” But the danger of believing in the wrong Jesus is it brings the same eternal penalty as believing in no Jesus at all! 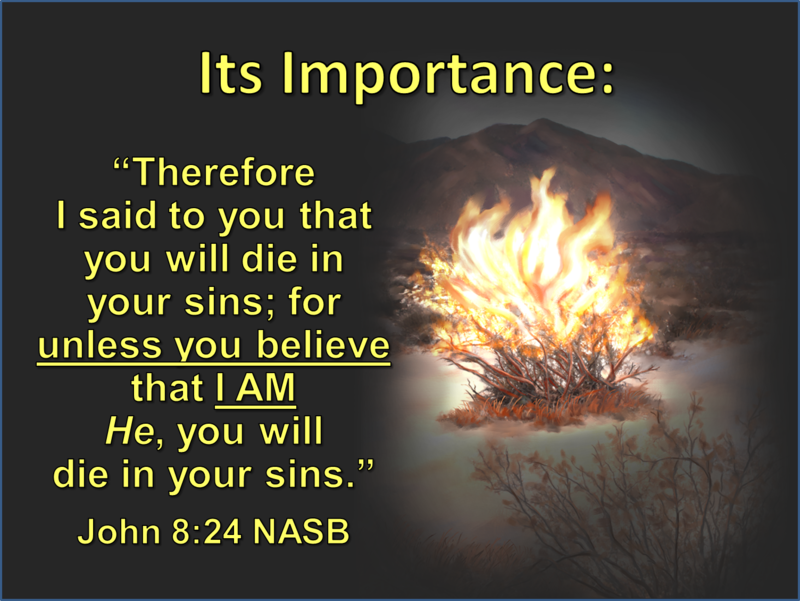 Using the same name by which God revealed Himself to Moses in the burning bush, Jesus said of Himself in John 8:24, “Unless you believe that I AM, you will die in your sins.” What does it mean to die in your sins? It means to die without forgiveness, condemned to an eternity apart from the God who loves you. Open your Bible, then, to John chapter 1, the first 5 verses where John clarifies what he means by “the Son of God.” The truth is mind-boggling! What he insists is that Jesus and the Father are One God who created all that there is expecting us His creatures to love and honor Him. To see that, let me highlight 3 key facts about Him, which John MacArthur first identified in his study. 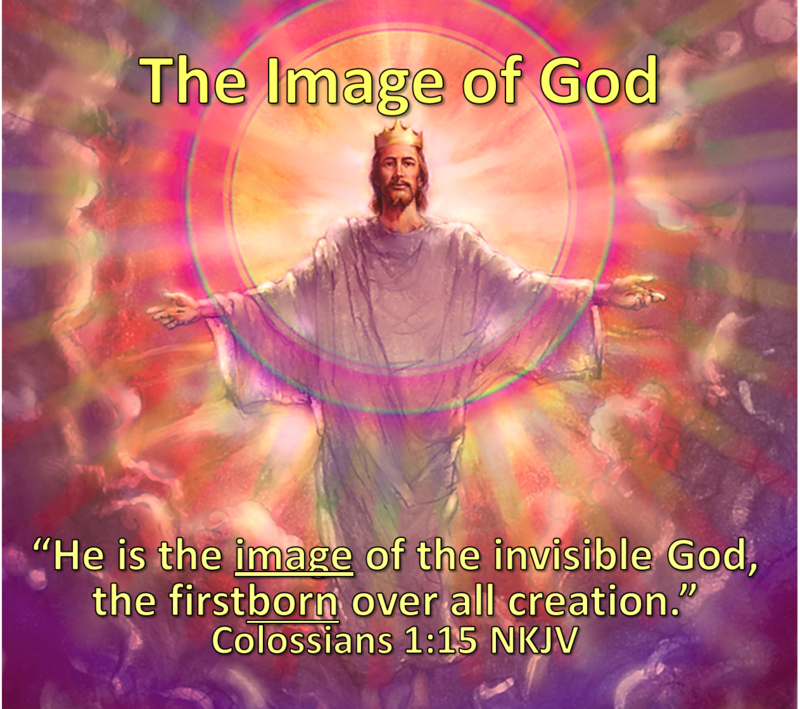 They are : 1) His pre-existence; 2) His co-existence; 3) His self-existence with God the Father. 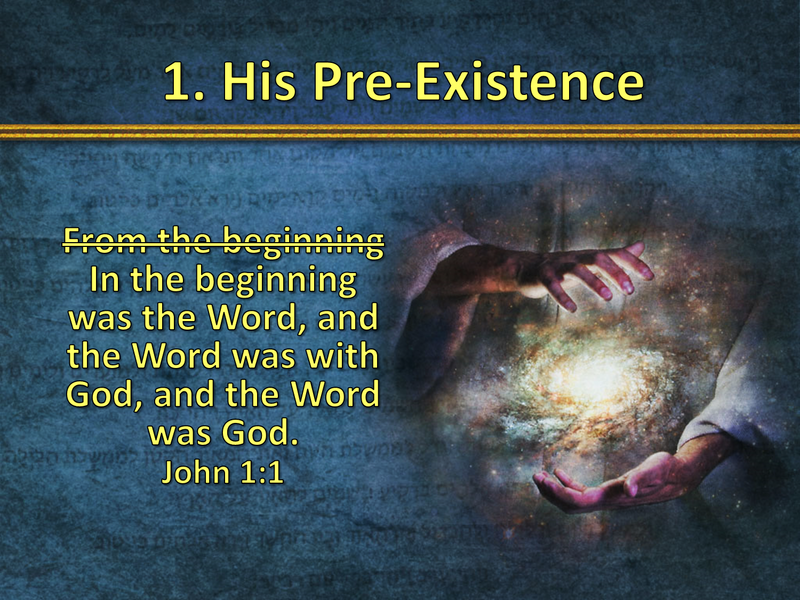 That’s important because it means at the point creation began, Jesus the Son of God already existed. For if John had wanted to say that Jesus was part of God’s creation, he would have written, “From the beginning was the Word.” But that isn’t what he said. He said, “In the beginning was the Word.” In other words, before time and space began and the world was created, Jesus already existed. To make that even more explicit, notice what He adds in verse 3. First, he gives the positive: “All things came into being through Him,” followed by the flipside, “And apart from Him (literally in Greek.) “not one thing came into being that has come into being.” Consequently, if He made everything there is and all things came from Him, He couldn’t possibly have been created. He must be eternal, existing with the Father forever before time began. Last week I introduced you to a little Greek, the language in which the New Testament was originally written. 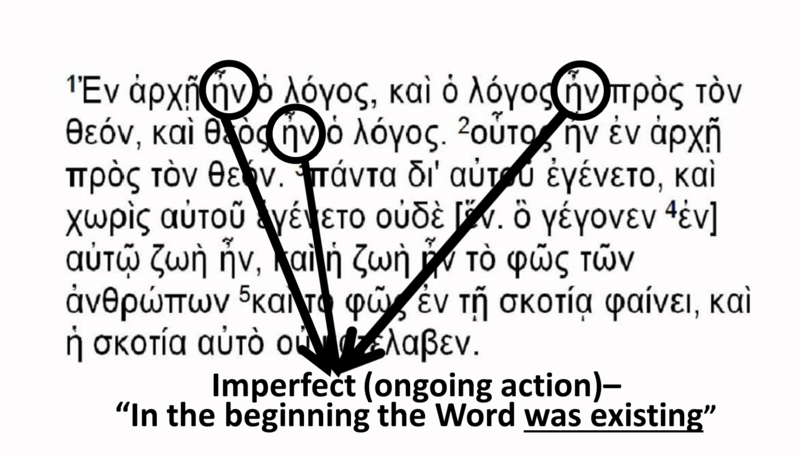 I did that explaining that the word “was” (ἦν in the Greek) is a key word here because of its tense. It is in the imperfect tense describing ongoing action. It isn’t just that the Word existed in the beginning; it’s that He existed continuously before time and space began. Time and space are a creation of God. So if Jesus the Son of God existed before time and space began, it means He isn’t a created being; He is eternal, which means He must be God, for God is the only Eternal and Uncreated Being there is! 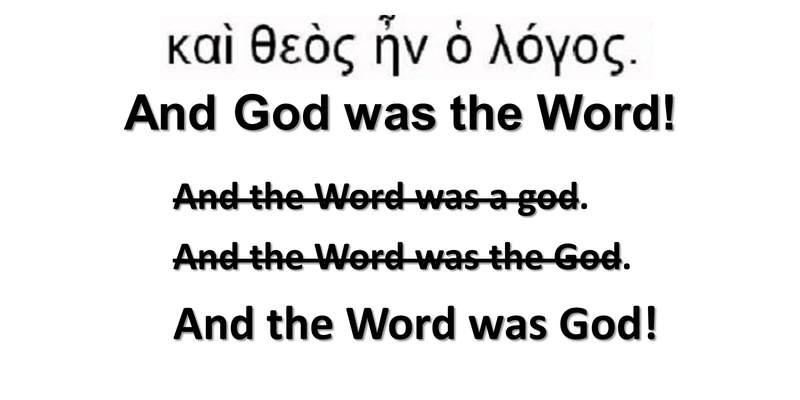 Then, to leave no doubt about it, he adds at the end of verse 1: “The Word was with God, and the Word was God!” That phrase has been a source of debate by some over the years who say that instead of translating it “God,” it ought to be translated “a god.” So I’ve put the phrase on the screen so you can see it for yourself. Don’t worry! I’m not going to bog you down with a lot of Greek. But you’re smart people and it’s important for you to see it with your very own eyes instead of accepting what somebody else says about it. But it especially taught in the Gospel of John where we hear Jesus claim again and again to be co-equal with the Father, using titles that belong to God alone like: “I AM the Good Shepherd who lays down His life for the sheep;” “Before Abraham was, I AM;” and “Unless you believe that I AM, you will die in your sins.” Furthermore, not only has He lived forever as the Son of God; He has also enjoyed perfect love, joy, and unity with God the Father from eternity past. Listen again to verses 1 and 2. 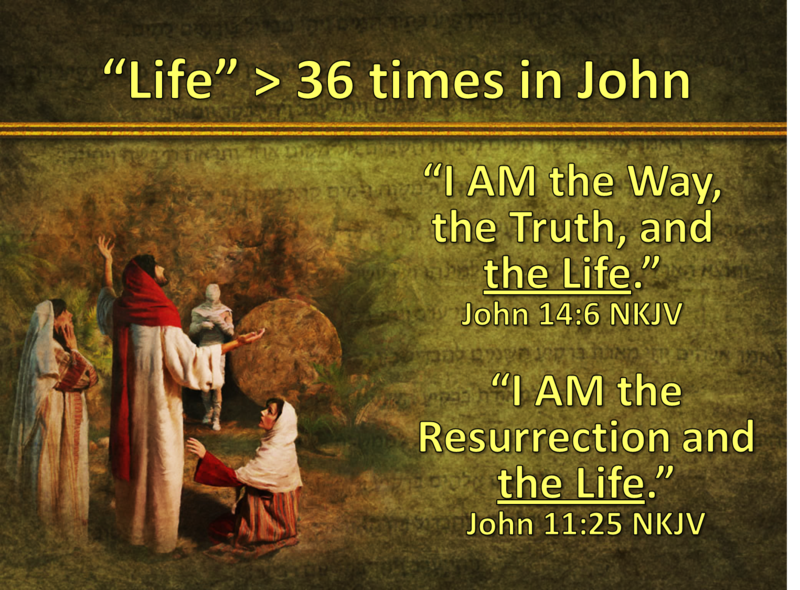 John says, “In the beginning was the Word, and the Word was with God, and the Word was God. He was in the beginning with God.” Twice in two verses, John says, “the Word was with God.” So now we know something else about Him—not only is He God, He was also with God. But if He was both God and with God, that means there must be Two Persons who are God. Exactly! That’s the very point John is making. 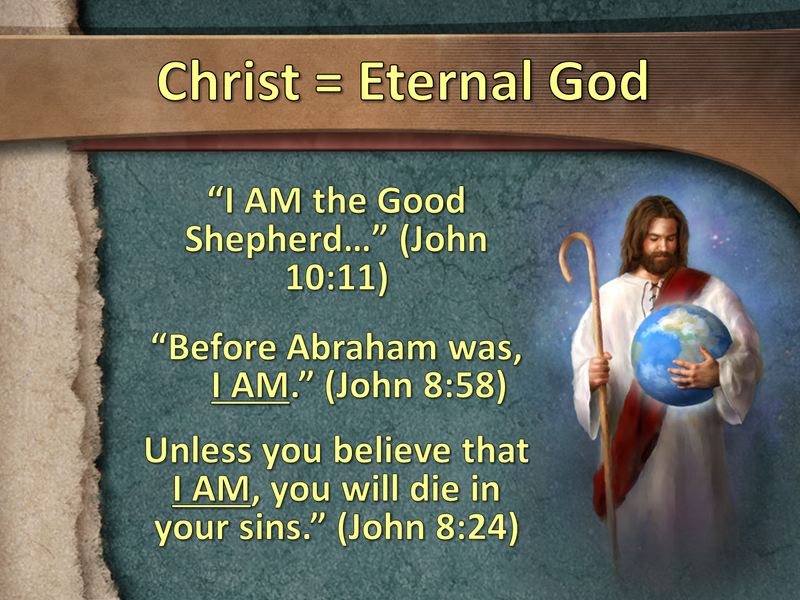 Not only is Jesus the eternal God, He is also distinct from the eternal God. 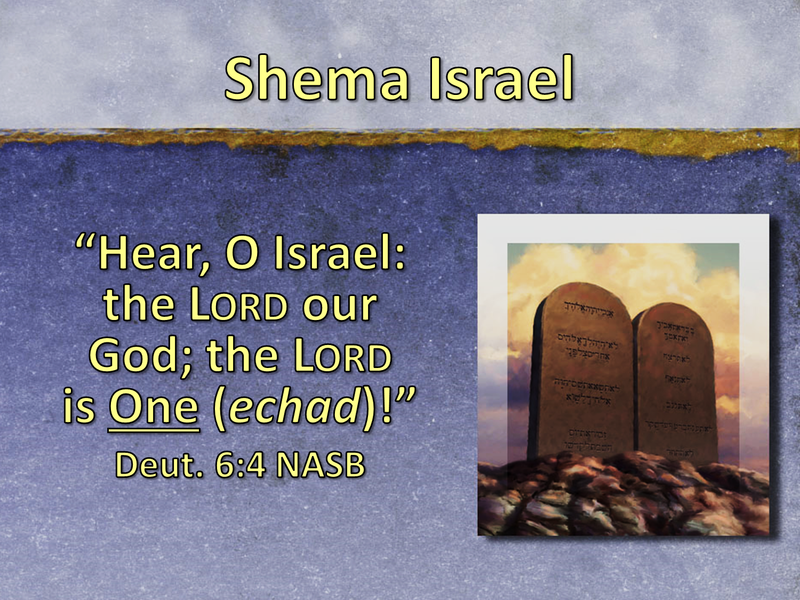 Who, then, is the Second Person He was with who is called God?” The Father, of course! “Huh?” you say. “That doesn’t make sense!” Maybe not; nevertheless it’s true even if you aren’t able to understand it, for John is now leading us into a realm where human reason is of no help and introducing us to a concept which the finite human mind simply cannot understand. 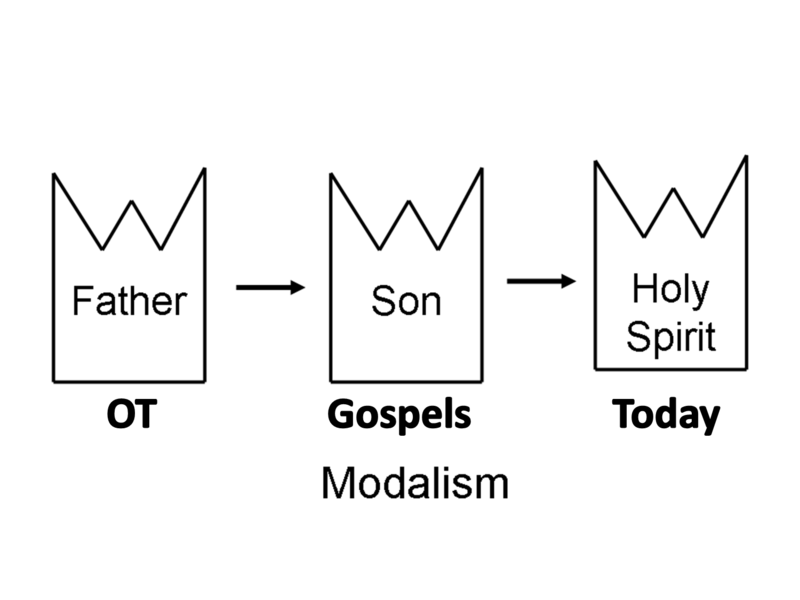 He’s revealing that within the Essence of the One True God is a plurality—Father, Son, and Holy Spirit! 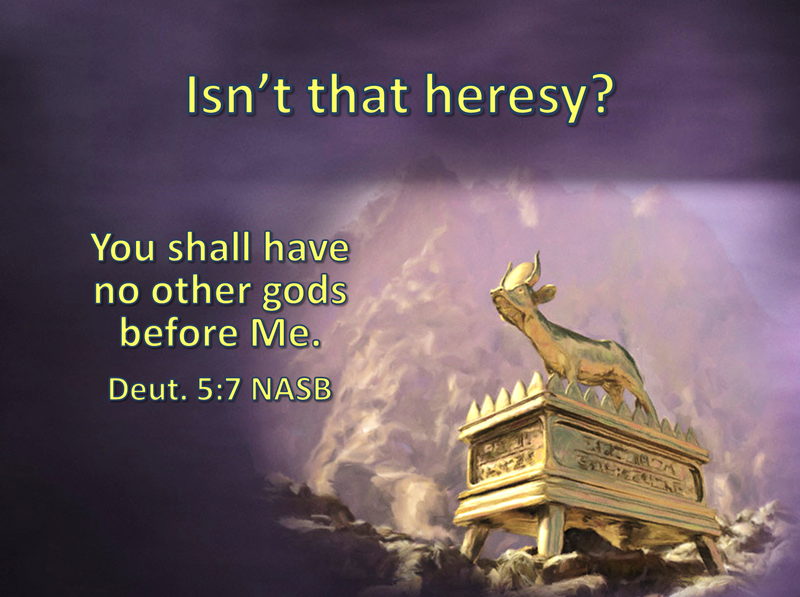 “But that’s heresy, isn’t it?” you worry, “and the very thing for which the people of Israel were punished again and again—worshiping other gods in addition to the One True God?” For example, it wasn’t but days after receiving the Ten Commandments that they coerced Aaron into making a golden calf, which they proceeded to worship, bringing the wrath of God down upon themselves. But as it turns out, you don’t need to worry, for Jesus said it is neither a heresy nor disloyal to the Father for us to worship the Son. For never has there been a twinge of jealousy or rivalry between Them. On the contrary, Jesus said it is rebellion and disloyalty not to give the Son the same honor we give the Father. Talk about claiming to be equal with God! But that’s what Jesus does in this Gospel again and again. In fact, at one point He comes right out and says it. John 10:30—“I and My Father are One.” Not only is that “off the charts” in arrogance if Jesus isn’t God; the Old Testament says it was also grounds for the death penalty, which is why His enemies immediately picked up stones to kill Him. But the truth is Jesus is equal with God. That’s John’s point in verses 1 and 2. You see the phrase “with God?” The word in the original means face-to-face with someone. And nobody can do that but Jesus alone. Angels don’t stand face-to-face with God. Nor do human beings! Instead, what do human beings do when they come face-to-face with God? They fall on their faces in worship, lest they see the face of God and die. But not Jesus, for Jesus is equal with the Father from eternity past. By the way, this is also a great verse for Father’s Day, for it gives us a perfect model for the way fathers and sons ought to relate to one another. John says that Jesus and the Father have forever lived in perfect face-to-face, eye-to-eye fellowship with Each Other, never wavering in their love and respect for One Another. I say that because you know where else we find this word? 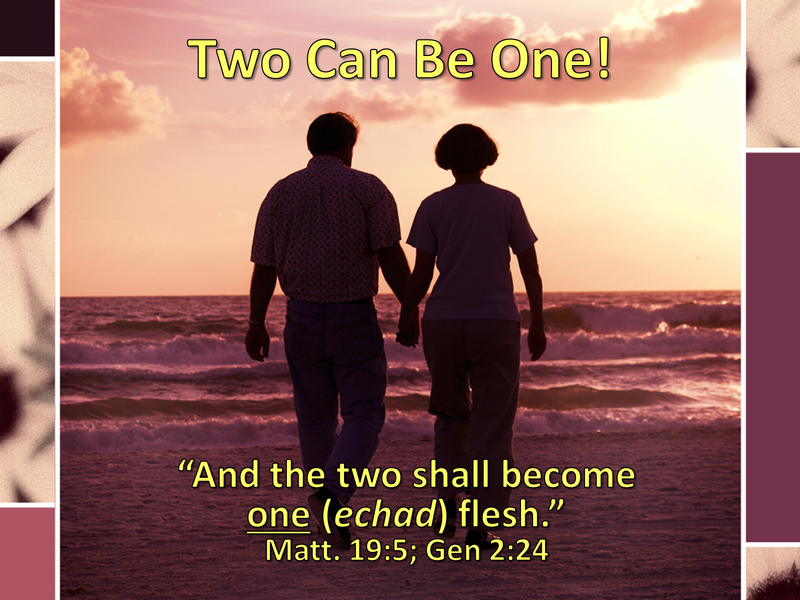 It’s used in Genesis 2:24 where the Lord says to Adam and Eve, “For this reason a man shall leave his father and mother and be joined to his wife, and the two shall become one flesh.” Two persons but one flesh! That’s the same idea when it comes to the Trinity. There are Three Eternal Persons – Father, Son, and Holy Spirit – who are together One God in essence and unity. The truth is God is different from every other Being who has ever existed. Does that surprise you? For example, when it comes to people, how many persons has He allotted to each human being? Just one, right? But that isn’t true of God. In God’s case, there are Three Persons who share the One Essence which is God. This also means that God has never been alone or lonely, but has always enjoyed perfect, fulfilling fellowship together—Father, Son, and Holy Spirit. I emphasize all of this because there are all sorts of heresies today which deny and distort the doctrine of the Trinity. One of the most prominent that’s been going around for centuries and is very popular again today is called “oneness theology.” There is nothing new under the sun! This is one of the core beliefs of the United Pentecostal Church which numbers 25 million members worldwide. But it is very different from mainstream Pentecostalism. Many of you have a Pentecostal background, as do I. I was led to Christ by Pentecostal believers and spent the first part of my Christian life worshiping in a Foursquare Church. But the UPC is very different from mainstream Pentecostalism. So let me say it one more time to make sure no one is confused about what the Bible teaches. 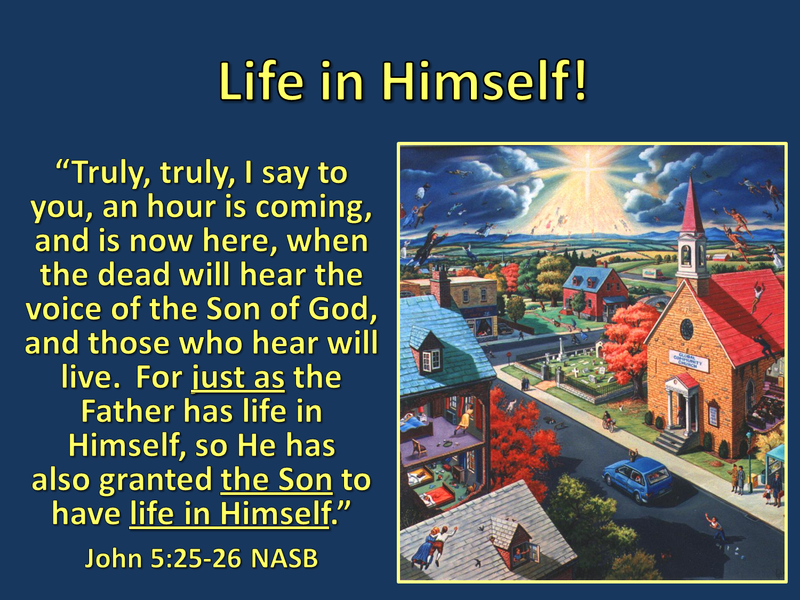 John is saying that Jesus Christ is God, co-equal and co-eternal with the Father, enjoying a glory from eternity past that belongs to God alone. Do you know what an amazing statement that is! It takes our finite minds to truths we cannot hope to understand. Try that as you’re trying to fall asleep tonight. Start thinking about God the Father and God the Son being eternally alive together – never a moment when they didn’t exist – and you’ll find it’s more than your feeble mind can take in—trying to grasp the eternity of God. But that’s what we used to be like too! You and I used to live in the darkness. But no longer! Isaiah 9 says of us, “The people who walked in darkness have seen a great light; and those who lived in a land of deep darkness, on them the light has shined,” so that we now love the Light and the new insights it gives us. Furthermore, John says the Light is powerful. Physicists still have a hard time defining light. After all, it can’t be matter since it has no mass and travels at a speed of 186,000 miles per second. And yet, it also occupies space and can be reflected, absorbed, and produce great heat. So what is it? 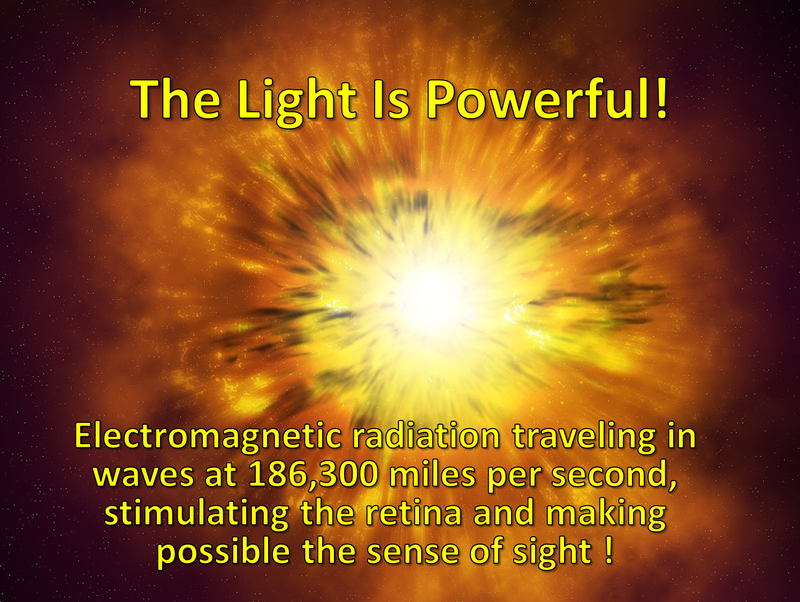 The best stab science is able to make at it is to say that it’s energy—electromagnetic, radiant energy which, when it hits the retina of our eyes, stimulates our sense of sight. That’s what Jesus does for us spiritually. 1 Corinthians 1:24 says, “To those who are called, Christ is the wisdom of God and the power of God.” He gives us a new understanding of the truth as well as the power to overcome the darkness when it presses in upon us. Some of you will see in the margin of your Bible that there is an alternate reading for verse 5, and that the word “comprehend” can be translated “overcome.” “The Light shines in the darkness, and the darkness did not overcome it.” That’s the best translation of this word katalambano, which means to “take something down” just like a wrestler might take down his opponent. However, in this case, I think it is one of those unusual verses where the author may have both concepts in mind. 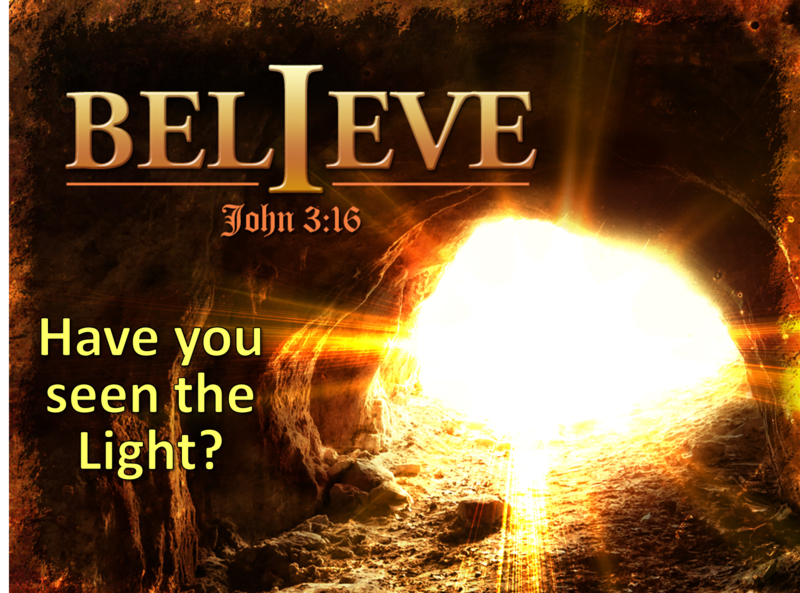 Jesus gives us a new understanding of the truth as well as power to keep from being overwhelmed by the darkness. I’m sure you have felt that way at times—discouraged by all the evil around us and wondering if there’s any hope left in the world. But then the Light breaks in upon you, and suddenly you find yourself with new power and understanding. It makes me think of my friend Bob who is hiking through Ape Caves with his kids today. 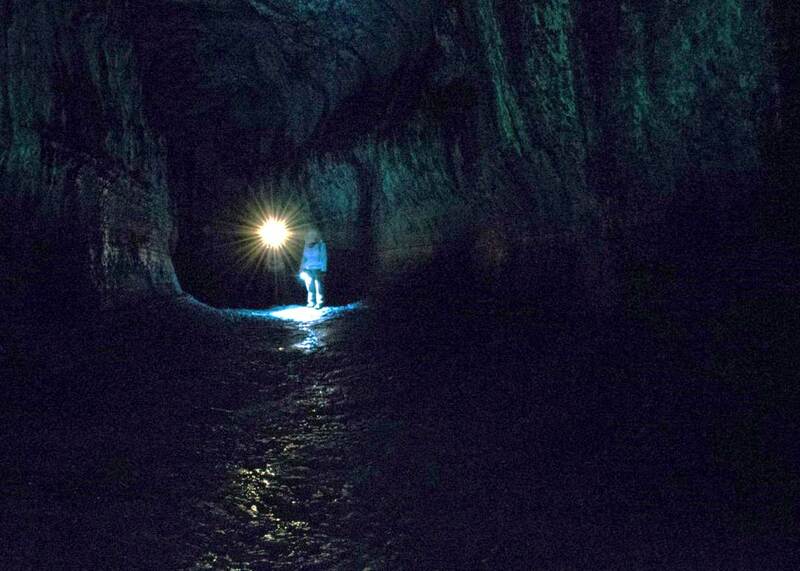 Ape Caves is a 2-mile long network of caverns just below Mt. Saint Helens. I’ve been there twice, years ago now. It’s one of those dark places where if you turn off your lantern, you can’t see your hand in front of your face. So you immediately turn it back on, and the darkness quickly flees away. That’s what John is saying here. “The Light of Christ is so strong that no matter how hard the darkness tries—and believe me, the devil has been trying to put out the Light of Christ from the moment He entered this world—without success! First, it was Herod slaughtering the babies in Bethlehem and its vicinity. Next it was his temptation in the wilderness, then his attack on Jesus in the Garden, trying to keep Him from going to the Cross, and finally the crucifixion and the devil’s premature celebration that he’d put an end to the Son of God. But guess what! The Light is still shining! In fact, it’s been shining for a long time now—almost 2,000 years, and there’s no sign of it going out. But then that’s what Jesus promised, and His promises cannot be broken. He said in John 8:12, “I AM the Light of the World. He who follows Me will not walk in darkness, but shall have the Light of Life.” In fact, His Light isn’t just holding its own against the darkness; it’s actually winning the battle despite our fears. 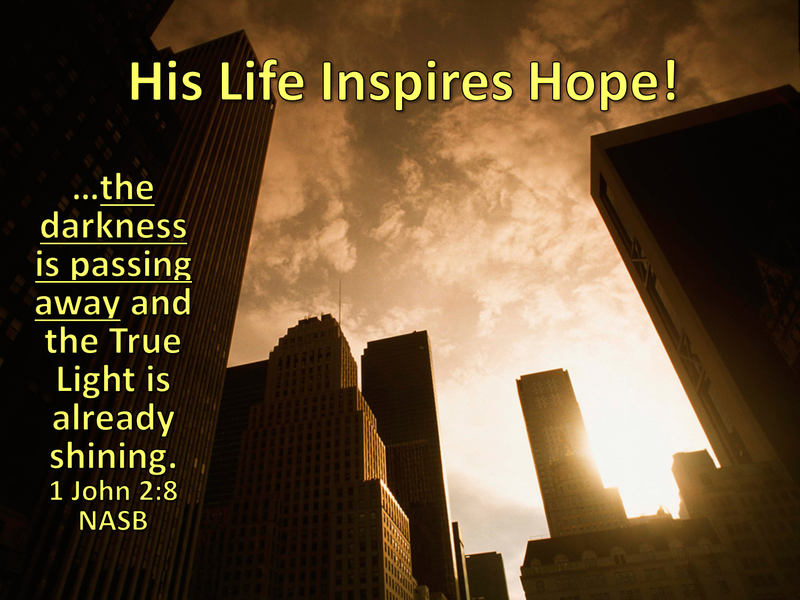 In 1 John 2:8, John assures us further, “The darkness is passing away, and the True Light is already shining.” Colossians 1:17 says something similar. Paul reminds us that Christ is not only the Creator who gives life to all things, He’s also the One who holds all things together by His power. So be not afraid, little children, it isn’t the government that will save us; or the church or angels of God that will keep the evil of this world in check; it’s Jesus Christ who is not only the Maker of all things, He is also the Sustainer of all things who is this very moment holding all things—this world, your life, your marriage, your finances—together by His gracious and almighty power. So let me ask you as I bring this study to a close. Have you seen the Light? If not, open your heart and believe today! Accept what God says about His Son in His Word—that He is co-eternal and co-equal with the Father. Consequently, the only way to honor the Father is by giving to His Son Jesus the same love, worship, reverence, and honor that you give to God the Father. This entry was posted in Uncategorized and tagged Darkness, Eternal Life, Eternity, Father God, Heresy, I AM, Jesus Christ, Light of the World, modalism, oneness theology, Son of God, Trinity. Bookmark the permalink. I just love reading about John!! I think you explain it so well and your such an amazing teacher for all of us!! Love, love, love this Gospel!! Thanks for all that you do for all of us!! No disagreement with that. Jesus Christ is the Lord of heaven and the earth, the Alpha and the Omega, the Beginning and the End. But He also said that He didn’t act or speak on His own initiative, but only did that which pleases the Father. So there must be at least Two Persons who are One God. That would be in keeping with Genesis 1 where God says, “Let us make man in Our image.” But wait! Ananias and Sapphira lied to the Holy Spirit who is also called “God” in Acts chapter 5 and yet is distinct from the Son and the Father. So now we have Three Distinct Persons who are called God. So you’re right. The word Trinity isn’t used in the Bible, but the truth of it certainly is. I pray that you and everyone else who is reading this discussion will have the faith of a child and humbly accept what Scripture teaches – that Father, Son, and Holy Spirit are Three Persons who were, are, and forever will be One God, who are worship of all our love, adoration, service, and worship. Now may the Father from whom all things come, the Son who gave Himself for our sins, and the Spirit of Grace confirm the truth as it is written in His Holy Word. Sorry I won’t be able to post any more of your comments on our site. It is not a place for you to sow doubts about the historic Christian faith. Instead the Bible commands me to fight for “the faith once delivered to the saints.” Jude 3 So we will just have to agree to disagree.